On 20 March 1991, we were blessed with our daughter and we named her “Nidhi” and she was a treasure in the real sense. She was christened “Susan” after my mother, in accordance with the customs of the Syrian Orthodox Christians of Kerala. After my tenure as a Brigade Major and prior to my joining the Technical Staff Course at Pune, there was a three months gap and hence in September 1995, I moved to our parent regiment – 75 Medium Regiment, then located at Udhampur. Marina, who was running a small business then and our daughter who was attending pre-school were stationed at Delhi. During the Dushera holidays, Nidhi wanted to visit me and spend a week with me and so she was put on the Air India (then Indian Airlines) flight to Jammu as an unaccompanied minor. Marina was not scared at all to send her all alone as Nidhi was pretty confident and Marina was pretty sure that Nidhi could handle herself well. She felt butterflies in her stomach only after seeing her off with the airline ground-staff. I was waiting at the Jammu airport and when Nidhi came out I asked her as to how the flight was and she said that she had put up an ‘about to cry’ face and the air hostess got scared and stuffed her with lots of chocolates and cookies. I was then staying in the single officers’ accommodation in the regimental premises and we dined in the Officers’ Mess. How to keep a four year old daughter busy all day was the intriguing question that came to my mind. Two people in the regiment came to my rescue. The first was the Religious Teacher, who would take Nidhi to the Regimental Mandir and narrate all the Hindu mythological stories to her. The next was the (RHM) Regimental Havildar Major (Sergeant Major) Sengole, who would take Nidhi around the unit with him. She enjoyed watching the gunners carryout their gun drill practices on the Bofors Guns, the chef in the kitchen rolling out ‘Rotis’ in hundreds for the men, the drill at the Quarter Guard, men maintaining their rifles in the armoury, vehicles being repaired in the workshop, etc. A word about RHM Sengole. He is six feet tall, dark and well built soldier with an imposing personality who hailed from Madurai in Tamil Nadu. As a Sepoy, he was the Light Machine Gun (LMG) handler when I was a young Lieutenant performing the duties of Gun Position Officer (GPO). When he became a Naik (Corporal) he was the Commanding Officer’s stick orderly when any VIP visited and when he was promoted to a Havildar (Sergeant) he was special guard commander – all because of his blood red eyes and the moustache he had painstakingly grown, which would easily put forest brigand Veerappan to shame. Sengole was initially a bit surprised to see a four year old girl smiling at him as all kids were literally scared at the sight of him. He once confided that even his twins were also scared of him when he visited them during his vacations. The secret was that after having spent over a decade with Sengole, I knew how soft at heart and calm this God-fearing and fearful looking person was. Having grown up in a family of four sons and educated at the Military School and later at the Military Academies and having served all the while in a male only environment of the Indian Army, the only issue I had was to comb and set Nidhi’s hair. She had long and thick tresses and when I tried to run the comb through, I realised how difficult it was to even get the comb down the thick growth. That was when Mrs Jadeja, wife of Captain Vikram Jadeja, who was our Battery Second-in-Command, came to my rescue. I would dispatch Nidhi to her house whenever she wanted her hair done and she could also play with their two lovely daughters Rachna and Archana. After a few days Nidhi walked up to me and asked “What is the difference between a Gola (गोला) and Goli (गोली)?” I had no answer and she said that the Gola is as big as what she is and is fired from the Bofors Gun and Goli as big as her middle finger and is fired from a rifle. After spending two weeks with me, she went back to Delhi, again as an unaccompanied minor with an ‘about-to-cry’ face. That was my first experience of single-parenting. Marina migrated to Canada in February 2002 and I moved to take over command of 125 (Surveillance and Target Acquisition (SATA) Regiment which was then operationally deployed in the Rajasthan Sector. The children were sent to Kottayam, Kerala, to live with their grandparents and study there. Nidhi immediately picked up Malayalam and started to read and write the language as Malayalam was the third language for her as part of the Grade 5 curriculum. The children along with my mother moved in with me to Devlali, Maharashtra, as the regiment had moved back to its permanent location after the operational commitments. There started my second round as a single parent. Nidhi immediately readjusted to the military environment and she had continued with her fluency in Hindi language. Our son Nikhil, then in Kindergarten, had completely forgotten Hindi and his brains were reformatted to Malayalam. The regiment was real well oiled machinery and Late Colonel Suresh Babu was the Second-in-Command, who along with the other officers ran the regiment exceptionally well and was the best unit in town. The soldiers in the regiment were totally self-disciplined and needed no supervision or ‘spoon feeding’. It appeared that all they needed was directions with clean and trustworthy leadership. This ensured that I could spend more time with the children as I had to spend under 10 hours a week in the regiment, and I had mastered the art of total delegation. Preparing Nidhi for the life ahead in Canada, I wanted to make her totally independent. She had to polish her shoes, press her school uniform and make her bed. My helper Naik Santhosh would always help her out after ensuring my absence. Nidhi had to cycle to and fro her school. Our home was situated on a hillock and hence going to school on a cycle was bit easy, but the return trip on a warm afternoon was bit difficult. She would at times call up the regiment to say that the cycle is punctured or the chain had come off and the men in the regiment would gladly send her a truck to pick her up and the cycle and drop off at the home. One day Nidhi asked me as to whether I was commanding a regiment or not. I enquired as to from where that doubt had arisen. “All the kids in the class say that you are not the Commanding Officer, otherwise I would have been dropped off to school in the Commanding Officer’s Vehicle” she said. I kept mum for a minute and told her that for the entire world I may not be commanding a regiment, but you know the truth. That was the days when I got a jolt of my life. Nidhi had attained puberty and as a dad who had all along lived in a male only world had no clue as to how to deal with the situation. I immediately rushed to my mother for some tips and was in for a rude shock when she said she too had lived in a man’s world for the past fifty years – with my dad and four sons – and she had never dealt with such a situation and had fully forgotten how it was when she was a teenager. I called up my wife and she spoke to Nidhi and gave all the motherly advise and how to cope with the changes. 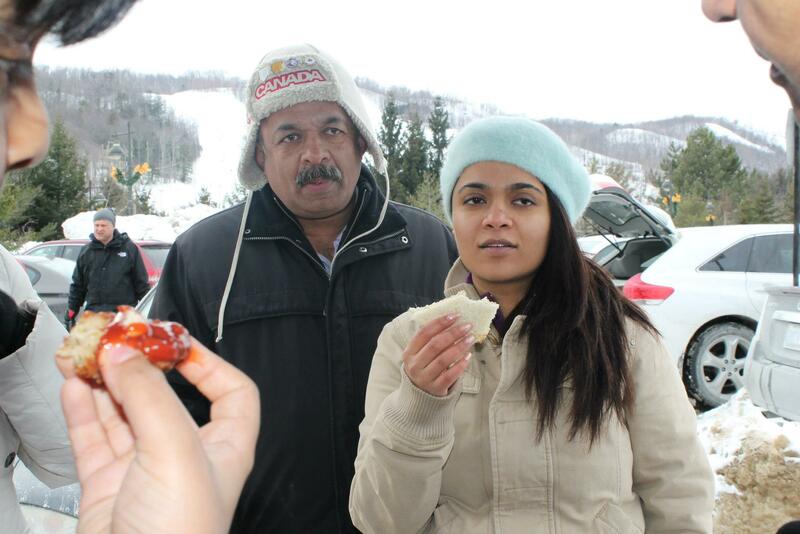 The children joined their mother in Canada in 2004 and Nidhi went to join the school in Grade 8. She was the fastest among all to adapt to the Canadian culture and environment (even faster than her mom who had spent two years in Canada by then). During her Grade 9, she bagged a plum role in the high school musical drama “Leader of the Pack” which involved rendering four solo songs and six group songs with over 16 costume changes. Nidhi kept up with her linguistic skills in Hindi and Malayalam, but Nikhil who joined in Grade 1 has fully reformatted his brains to the Canadian English mode, overwriting all the Hindi and Malayalam. Nidhi came out with flying colours from her high school and is currently doing her Bachelor of Sciences degree and is currently working with an event management company in Toronto. I pray to God to ensure her success in life. Nidhi is more than awesome in every aspect! I am lucky to know her in person during my stay with them at Toronto. Nikhil and Nidhi do make their parents and all of us very proud. Wish Nidhi all the very best ! Excellent write up, Reji. Now I can’t wait to meet her! You’re a different CO, Col. Reji. And that was a test to stand apart! You’ve done it. Excellent article… As parents you both have put great effort in moulding both Nidhi and Nikhil. And as a small boy I too had the opportunity to be groomed by Mr Reji and Mrs Marina once for 3 months in NDA Pune and in Mississauga, Toronto. Many many good wishes to your family. Big congratulations to Nidhi! That’s called living it to the core! Beautiful narration. No doubt Nidhi will prove her mettle as many other army daughters, who have excelled in various fields. Best wishes & God bless Nidhi. Great reading about Nidhi !! wishing you, Marina, Nidhi and Nikhil ( Chota Dada) the very best in life. god bless you all !! Great sir…I remember meeting you in Udhampur, in your unit, but the rest of it…am reading here!